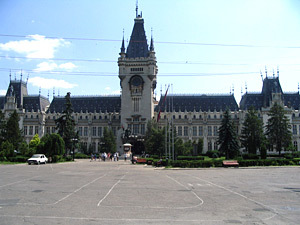 Palace of Culture – Iasi. 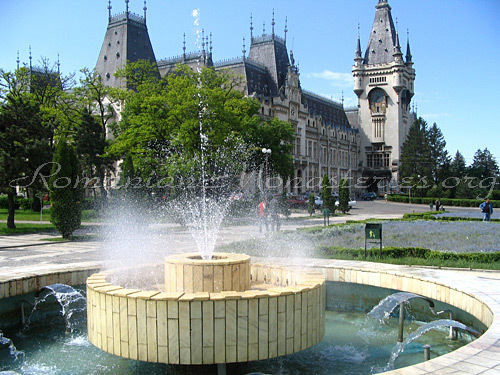 The Palace of Culture in Iasi is the main attraction point of the Moldavian capital. We can’t even imagine a touristic folder without the image of the famous building that shelters four museums, The Moldavian Museum of History, The Moldavian Museum of Ethnography, The Museum of Art, “Stefan Procopiu” Museum of Science and Technology, and “Gheorghe Asachi” District Library in the North-East side of the building. 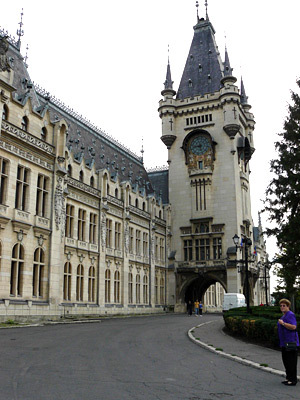 In the beginning of the 19th century (1806 – 1812), on the old ruins of the Royal Court of Moldavia, a palace in neo – classic style was built, at the wish of Prince Alexandru Moruzi. At the end of the same century a fire destroyed completely the building. Then, the construction of the present building started in 1906, after the plans of architect I.D. Berindei. In 1926 the Palace of Culture was opened by Ferdinand of Hohenzollern, the second king of modern Romania. During World War II, the Palace sheltered German troops, and then Soviet troops. Until 1955, the building housed the County Law Court, which had the furniture ordered from “Maple House” in London. Between 1975 and 1977 the wood bridging from the last floor was replaced with a cement one, fixed with steel nettings. The new bridging sustained the monument during the earthquake of 1977, but the bridging from the first floor, the walls, the ornaments and the relief works were affected. Unfortunately, the consolidation and renovation works are not finished yet. 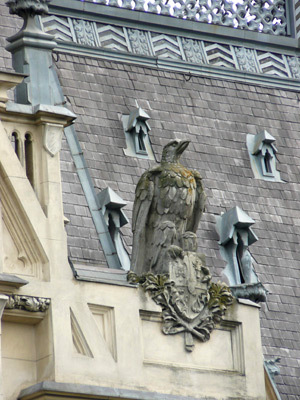 The entrance of the palace is through a great donjon tower, with crenels and alcoves dominated by an eagle with open wings. In the tower there is also a carillon clock that has an eight bells assembly that reproduces “Hora Unirii” (Hora of the Union) song every hour. It is said that initially the Palace was supposed to have 365 rooms (a room for every day of the year), but it has only 298 large rooms with a total area of almost 36,000 square meters. At the façade one can count 92 windows, and at the attic there are more 36 ogive windows. The main attraction points are the four museums. The Moldavian History Museum is located at the ground floor, in the West side, being the continue of the Antiquity Museum founded by Orest Tafrali in 1916. It has four sections, prehistory and ancient history, medieval history, modern history and contemporary history, presenting the main aspects of the development of the communities in the area from the Paleolithic time to the World War II. The equestrian statue of Stephen the Great in front of the Palace of Culture. The Moldavian Museum of Ethnography was founded in 1943, being located in the West side of the Palace, at the first and the second floor. One can admire here the objects used by the inhabitants of Moldavia in their every day activities: in agriculture, viticulture, raising animals, fishing, hunting, apiculture. One can also see interiors of peasant houses, devices used for pottery, weaving, wood processing, mask collections, traditional costumes. Many of these exhibits have more than 100 years old. At first floor there is The Museum of Art, the continue of the oldest pinacoteque in the country that existed along with the first modern Romanian university of 1960. The museum includes donations of Gheorghe Asachi, Scarlat Varnav, Costache Dasiade, A. Donici, V.A. Urechia and also Costache Negri’s collection. The Museum of Art has 24 rooms for permanent exhibitions, arranged in three galleries (universal art gallery, Romanian modern art gallery and contemporary art gallery) and has in its artistic patrimony over 6 000 works, among which almost 2500 are graphic works and 470 are sculptures. 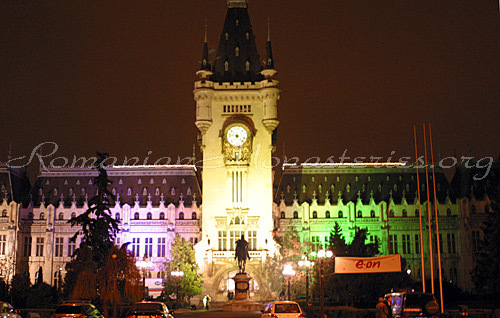 The Museum of Science and Technology is located on the ground floor of the Palace, in the East side, and is named after the great savant from Iasi, Stefan Procopiu. Founded in 1955, the museum has four sections: energetic, telecommunications, mineralogy – crystallography, recording and replaying of sounds. The first exhibits were brought by the donations of “Timpuri Noi” Plant from Bucharest, “Electroparataj” factory from Bucharest, electric networks factory from Timisoara and the Polytechnic Institute of Iasi. The foundation of a section that comprises a collection of computers is also under discussion. 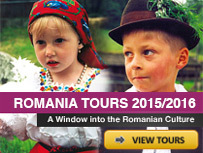 Besides the four museums, The Palace of Culture presents some other attraction points. One of them is the Gothic Room, where can be admired the mosaic that presents a medieval “bestiarum” (gryphons, bicephalous eagles, lions). There is also the Voivodes Room, located at first floor, where there are the portraits of Moldavia’s domnitors and Romania’s kings, starting with Decebal and Traian, paintings made by Stefan Dimitrescu and his students. Then there is „Henri Coanda” Room, which was named after the carvings and relief works made by the famous Romanian inventor of a cement invented by him, cement that imitates the color and sound of the oak tree wood, also the origin of the name of „bois- cement”. 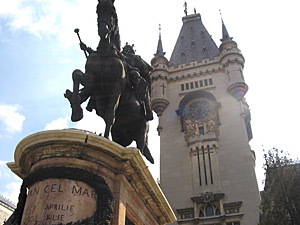 On the right there is the “Turnul de Straja” (the Watch Tower), reminiscence of the Royal Court of Iasi, along with the galleries underneath the court of the palace. On the left there is a collection of capitals and other stone architectonic elements grouped in a lapidarium. In front of the The Palace of Culture) there is Stephen the Great equestrian statue, framed by two Krupp cannons, trophies from the Independence War, conquered by the “Regiment of Dorobanti” from Copou and donated by King Carol I. Stephen the Great statue was made in Paris by Em. Fremiet after Gheorghe Asachi’s plans, and unveiled in 1883. It is said that poet Mihai Eminescu wrote the famous poem “Doina” [the name is a traditional type of Romanian song](“De la Nistru pan’ la Tisa) [“From Nistru to Tisa”] right after this moment. Hi, there at the Museum of Science and Technology !